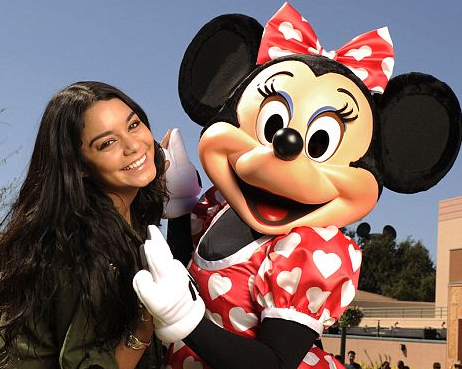 Vanessa Hudgens, the star of Disney’s High School Musical series, spent time in Florida this weekend at Disney’s Hollywood Studios. The actress and singer was doing a press visit for her new upcoming film Beastly, a modern-day retelling of the classic Disney movie Beauty and the Beast. Vanessa was certainly the Belle of the park too as she posed for photos with Minnie Mouse and the Beast character. Even though she was spotted the day before Valentine’s Day, onlookers, according to the Daily Mail, say that the newly single 22-year old looked magically happy as she toured the park. Beastly, also starring Neil Patrick Harris, Mary-Kate Olsen and British actor, Alex Pettyfer as the Beast, is set to arrive in theaters on March 4, 2011. The plot focuses on Kyle Kingson, played by Pettyfer, a handsome man with a mean attitude who disrespects a classmate, a witch in disguise, Hudgens, during an environmental event. Like the animated film, he is transformed into a beast and learns to find love anyway. Photo by Todd Anderson, courtesy Walt Disney World Resort. Orlando, is a perfect place for the kids to explore about Disneyland. A good feature post.